Cardiff midfielder Don Cowie has urged his team-mates not to be discouraged after dropping to the bottom of the Premier league. The Bluebirds are now two points adrift of possible safety following Sunday's 4-0 loss against relegation rivals Sunderland. Cardiff face Newcastle and Chelsea in their two remaining matches. "We can't feel sorry for ourselves. We've got six points to play for," said Cowie. "If we can get the points, who knows what can happen?" Cardiff had a strong penalty claim turned down before Sunderland took the lead at the Stadium of Light. And the Black Cats' second came in controversial circumstances when referee Phil Dowd gave a penalty and sent-off defender Juan Cala for a foul on Connor Wickham. Dowd initially played the advantage but, when Wickham failed to capitalise, awarded the home side a penalty and showed a red card to Cala. Cardiff were furious at the decision, but Fabio Borini kept his nerve to slot home the spot-kick. Cowie said the players were not focused on the controversial decisions. "It's just the ref's decision," he said. "There's not much we can do about it. We've got to accept it and move on. "The boys went out second half and worked hard. It's hard when you've only got 10 men. "You're going to leave yourself open and it's disappointing for the result to end up as 4-0. "I'm sure we'll dust ourselves down and when we come back in we'll make sure we are ready for the next game. "All we can do is go into it and make sure we give it our all. "They've been struggling a wee bit lately, Newcastle, so hopefully we can get three points." 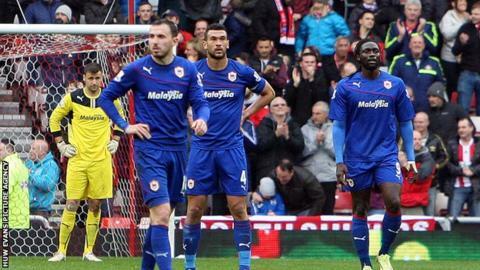 Can Cardiff City stay in top flight? Read more on Can Cardiff City stay up in the Premier League?